Eternal Father, You created us in Your own image and likeness, but sin has warped the minds of men and throughout the world there is much injustice and much carelessness of the rights of other people and personal responsibility. Lord when You are excluded from the hearts and consciences of men, the inevitable result is that people suffer and Lord, there is much injustice and corruption taking place in our world today, not only in the lives of individuals but also in the corridors of power and the council rooms of many nations. Dear Lord Jesus, You were the One that came to seek and to save that which was lost – and Lord there are many lost and hurting people in our world today that are having to comply with unjust government measures and rogue governors – whose decisions often leads to intense misery and pain. Be gracious to all who have been unjustly treated by unfair measures, and look down on them in pity and mercy we pray. Provide for all their needs, according to Your riches in mercy. Keep us Lord form trying to address the ills of this world from a human perspective, for we wrestle not against flesh and blood but against principalities and power - against the spiritual rulers of this dark world – but thanks be to God Who has won the victory over them all through our Lord and Saviour Jesus Christ. I have been falsely accused of some misconduct at work. And has been on suspension since 9/6/2015 and investigation have been completed, now hearing is on the 28/8/2015. Lord, I will keep this short. Please pray for us living in crime zones and war torn countries. 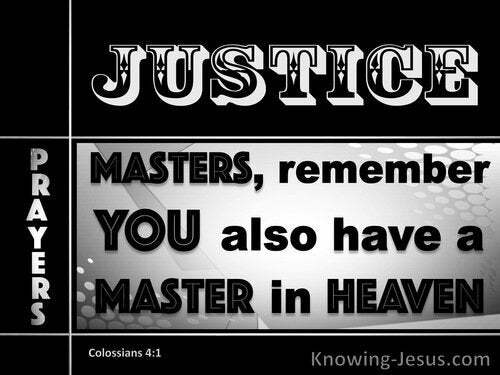 Please pour out your justice then your Holy Spirit of Peace. Thank you.